The line runs through the south east of Glasgow. When built the area was rural, but today there is housing from Rutherglen to Cambuslang and around Newton, Uddingston and Motherwell. The area had coal-ming at Cambusland, Newton and around Motherwell and the Hallcraig Steelworks at Newton, which was rail-served. The line joined the Polloc and Govan Railway (at Rutherglen) to the Wishaw and Coltness Railway (at Motherwell). Cambuslang is a two platform station served by local trains. 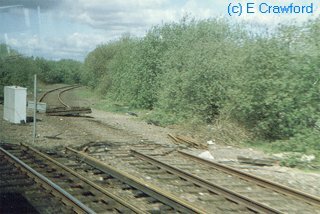 Here the Lanarkshire and Dunbartonshire Railway joined from the north and west at an east facing junction and at the same location the Lanarkshire and Ayrshire Railway joined from the south and west at an east facing junction. 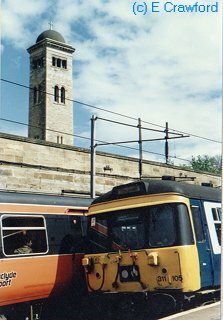 The line running north was retained for Westburn Engineering, out of use, until the 1980s. Newton station has two platforms and is bypassed in addition. The station is served by trains passing round the Hamilton Circle. Uddingston station still has a very fine station building. This is a two platform station. To the west the line crosses a large viaduct with the obvious remains of another viaduct running next to it. Looking east over Uddingston Junction. Bellshill route (Cleland and Midcalder Line) to left, Motherwell route to right. The new station at Motherwell is a large one with four platforms - two on the mainline south and two on the Hamilton Circle. To the north are the Motherwell Bridge sidings and Lesmahgow Junction (now called Motherwell Junction) where the Motherwell Deviation Line goes north towards Mossend.